Back in November 2017 we wrote on this blog about the exciting work we were undertaking to try and bring about better ways to help residents improve their streets. It is hoped that with resident engagement we will help to make local streets a better place to live; whether through greening, more trees, traffic calming measures, and improving road safety more generally. After much discussion with both officers and residents we have been able to secure a drop in event for local residents on Saturday 24 March in the Salvation Army between 12:00 – 15:00. Flyers like the one below have been distributed across Thurlow Park, and we invite you to attend to share your ideas. There will be light refreshments available, Officers will be on hand to answer questions, and residents can complete the questionnaire which will also be available. If you are not able to attend please do complete the online questionnnaire (www.lambeth.gov.uk/thurlowpark) or visit www.lambeth.gov.uk/ourstreets to find out more. The consultation will close on Friday 06 April 2018. 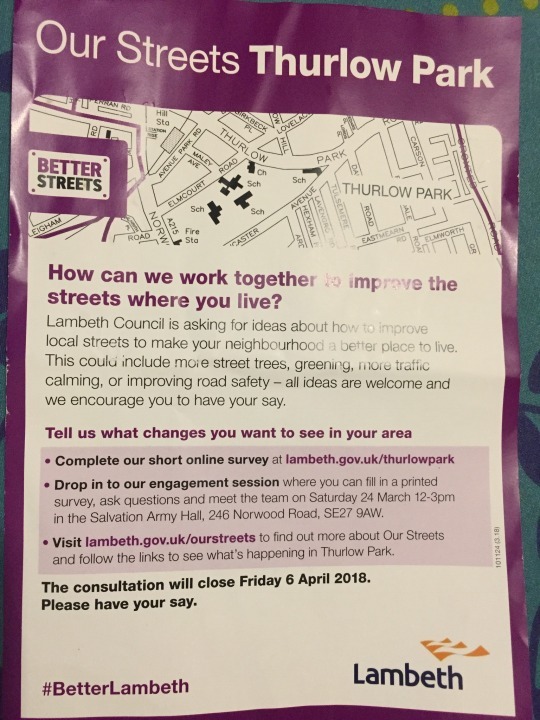 Posted on March 12, 2018 May 9, 2018 by thurlowparklabourTagged greening, ourstreets, road safety, speeding, traffic calming, trees.